Nowadays companies are eager to hire those employees who are able to think in an unconventional and out of the box manner. In order to attract customers they need to think of new and different ideas which are going to keep their company at the top. The moment a company stops keeping up with the latest trends and start moving backward rather than forwards, then surely the company will have to shut down. There are various ways in which people think. Some think analytically, some critically, some according to the rule book and there are those who think out of the box. Here are some ways to help you to start thinking out of the box. Thinking out of the box implies that you will let all that you have studied percolate into your mind and then put into practice all you have studied. The ability to think out of the box is a practical skill which will be able to get you out of a sticky situation. This is a quintessential difference between the street smart and the book smart people. The street smart ones, due to their limited opportunities and resources make the most of whatever little they have and in addition to that they put into practice the things they have thought of in their minds, rather than relying on any external medium. Thinking out of the box simply means that you do not follow the herd and do things in your own way. Most people do not take the effort to try doing thing their own way, when there is a tried and tested method of doing something. Yet rather than following what someone else has already done it is always better to try doing things your own way and writing your own rules rather than playing by someone else’s rules. Not all of us have it in us to stand apart from others and dare to be different. Thinking out of the box means that you are rather daring enough to try your hands at doing something outlandish. Along the path you might be faced with a fair bit of resistance and even criticism but you should ensure that you do not let your spirit of enquiry or your ability of thinking out of the box goes away. This is an ability which most of us are born with, but along the way we stop being individual and start playing the role which society wants us to play. Thinking out of the box means that you have the courage in your own convictions and you have faith in your own ideas. No matter what your idea is, you should not shy away from sharing it with others so that they sit up and take notice of you. If you have the ability of thinking out of the box but you do not air your opinions and views, then you are not living up to your own potential. Being able to present your ideas and put them into action is also an important part of thinking out of the box. 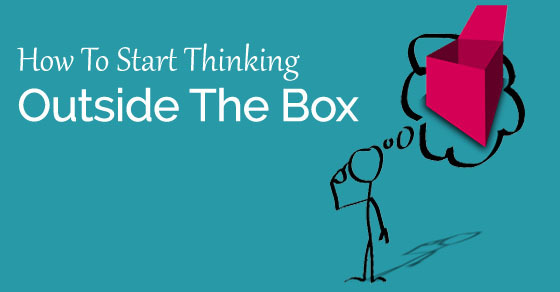 Thinking out of the box implies that you are able to come up with novel ideas which have seldom been thought of before. You have a perspective which is different from that of everyone else and your means of approaching any issue is fresh. It is for this reason that people who think out of the box are usually employed as part of a creative team so that their ideas are able to take the company to new heights. There is a fair bit of risk involved in thinking out of the box. Since what you are attempting to do has probably never been done before, there is no reason to not take the risk at all. There is no need to take huge risks which will put the company in a lot of financial trouble. Taking calculated risks which you are almost certain will pay off is a good idea. There is indeed a great deal of thrill which comes with thinking out of the box and it excites the person who is presenting the idea as well as those, who he is presenting the idea too. Fear of failure is something which many of us have and it is this fear that holds us back. Thinking out of the box means that you are willing to take the plunge knowing well that the results might not be in your favor. Thinking within the box, implies doing things the safe way because you know that things are going to pay off. Thinking out of the box means that you do things in keeping with your own ideas. You listen to the dictates of your mind and heart rather than following the conventions of the society or culture which you live in. Such a person will not believe in the superstitions, narrow minded thinking or hierarchy which the society in which we live in endorses. If you wish to become someone who thinks out of the box it is very important to not just mug up theoretical knowledge from various sources. It is very important to understand what you are learning and then spend some time thinking of how it can help you in your daily life. It is not merely enough to learn about something and leave it as something in the book. Even if you are studying history you should let the mistakes and success stories of the past influence how you will approach things in this day and age as well. Thinking out of the box, does not mean that you have your head in the clouds, rather it implies that you have a practical approach to doing things and will always keep a clear head when dealing with an issue. When you want to learn to think out of the box, you must ensure that you are keeping up with the changing times, lest your ideas will be impractical and even unattainable. A person who thinks out of the box will be very up to date with global trends and pressing problems in the world. To help you think in this manner you can always consider watching some videos or ted talks which are available readily online and which can plant some good ideas in your mind. Based on these seeds of wisdom you can start building up on these ideas and come up with your own theories and conclusions. We do live in the world of gizmos and gadgets and we must make the most of everything which is at our disposal. In order to think in this manner, it is very important that you give yourself enough time to come up with a good idea. Many people get frustrated after only spending a day thinking about a certain issue. Yet this is not the way in which to do things. In order to learn to think out of the box you must learn to take it easy and let the idea come to you rather than trying to squeeze it out of your mind. Getting one good idea could take as little as a few seconds or as much as a number of months. To think out of the box you must try and seek some inspiration from persons who are at the top of their field. When you speak to such people you will be inspired by their mannerisms as well as manner of approaching an issue. People who are at the top of their game are usually those people who have the ability to think out of the box and with so many years of experience they have been able to develop this skill. Books are able to provide one with infinite knowledge and wisdom. Getting hold of a good book can help you think out of the box and come up with rather different ways of looking at things. Once you have read your book, ensure that you do not let things end there, you should ensure that you brainstorm on a given issue which you feel like. Indulging in enriching exercises like this is what will help to make you a person who is able to think of new and bright ideas which will be able to help the society progress and benefit from. If you wish to learn to think out of the box, ensure that you do not bite off more than you can chew. As mentioned above take your time to think of an idea and just because you are beginning to think in this unique manner that does not mean that you become greedy and take on too many projects simultaneously. Thinking differently is rather stressful, so do give yourself a break from time to time. In addition to speaking to those at the top of their game, do not shy away from befriending those people who are smarter than you. By doing this you will be able to walk a mile in someone else’s shoes and see how they tackle various subjects. Your manner of thinking out of the box is not the only way of doing things. 1. When your work in a big corporate company, you must try your best to think out of the box. If you do not do so then you will never get noticed or be able to get the recognition which you ought to receive. For example, if you know for a fact that everyone at your company has planned to go about their work in a particular way, you should ensure that you try and come up with an unconventional way of doing the same task. If possible think of ways in which you can tackle the job quicker and more easily. 2. Secondly, for example, if you are assigned a project by your boss you should ensure that you put a little pressure on yourself to think out of the box and taken and opt to choose a path which has seldom been taken in the past. Doing things in this manner is bound to help you a great deal in the long run as you will show that you are not someone who just takes the easiest and shortest method to do a task, rather you really give your work your all and are very serious about what work has been entrusted to you. Some people are able to think out of the box naturally and with much ease. Most of us have the capability do so but our ability to think out of the box has to be sharpened and worked on a little bit. Having this ability is absolutely invaluable in the work place so you should try your best to accustom your brain to think in this manner. Things will not come easy at first, but over time you will naturally learn to come up with unique ideas, rather instantly. This skill is especially useful when it comes to solving some sudden problems which arise at the work place.